Problems frequently give a vague sense of disquiet, a sense of things not going in quite the direction you had planned however, you have no clear thoughts of what the ‘right’ direction might be. This exercise that follows was suggested by St Ignatius Loyola (some 500 years ago). Imagine being5, imagine you are now 5, how did it feel to be 5? Can you picture images and memories from that time? Imagine being 12, 25, 40, 65, after a few minutes, project your imagination to what you were like when you were 12, did you worry? What was important to you? What was your world like? Using the same method of thinking ask yourself the same questions for age 25 and 40 and 65. Imagine being very, very old; imagine looking in the mirror when you are very old. What do you see? How you feel about yourself? Who are you? Take a retrospective look over your whole life – what really mattered? What would you have like to have done differently? Are you ready to die? Imagine your death, what are your thoughts as you imagine yourself dying? Imagine your closest friends and relatives, what would they be thinking about you? Imagine being reborn, after a few, or when you feel ready, imagine you are going to be reborn. You can be reborn, anywhere at any time as anything you desire. What would your choices be? Return, when you feel ready to open your eyes, gradually look around you as if seeing everything for the first time. 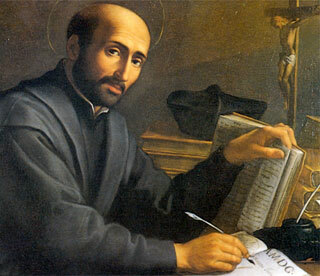 All of us can change our perspectives by following St. Ignatius’s exercise. Peggy Dupra a middle school principal had a problem with her female pupils who were experimenting with lipstick. The girls were kissing the mirrors in the bathroom leaving their lip prints on bathroom mirrors. The maintenance department constantly asked her to have the pupils stop this practice. Peggy lectured, pleaded and threatened the girls with detention, but nothing seemed to help. While the brain knows the imagined you isn’t really you, it will still respond from moment to moment as if it were real. You won’t just remember events; you will remember how you felt about them. Peggy tried the exercise. She began remembering all sorts of past friends when you was twelve years old, and how she really felt at the time about the world. She more she remembered the more she felt like a young school girl. She laughed when she thought of her best friend Ellen of years ago and how they always tried to gross each other out in a game they called “Yechhhh!” She remembered one time when they spread the rumor that the cafeteria was using sewage water from a ditch to make pizzas to save water. The students refused to eat the pizza. Suddenly thinking about how they grossed out students she got an insight on how to solve her bathroom lipstick problem. After conspiring with the janitor, she invited the girls into the bathroom saying she wanted them to witness the extra work they made for the janitor cleaning their lip prints. The janitor came in and stepped into an open toilet stall. He dipped his squeegee into a toilet, shook off the excess toilet water then used the squeegee to clean the mirrors. Changing her perspective from an adult to a young girl introduced a clever solution to her problem that she could not have discovered using her usual way of thinking. Discover the creative thinking techniques and strategies used by creative geniuses throughout history to get their breakthrough ideas.